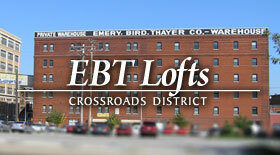 Located at the corner of 10th and Baltimore Avenue in the historic Library District of Downtown Kansas City, the Library Lofts is the ideal urban dwelling experience that exemplifies both affordability and functionality. This pet friendly building sits diagonally from the beautiful Kansas City Public Library and across the street from the ‘Community Bookshelf’ mural; exhibiting literary classic book spines on the Public Library’s parking garage. Unique interior loft designs offer spacious closets, large windows, original hardwood floors and skylights. Residence at the Library Lofts is complete with a fitness facility as well as a Club Room with a pool table and indoor putting green. A variety of chic floor plans are now available, with prices starting at around $700/month for Studios and $885 for One Bedrooms and $1,300 for Two Bedrooms. Garage parking is connected to the building via a catwalk and is available for a monthly fee. 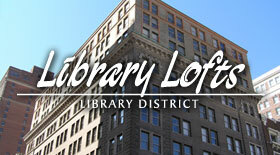 The Library Lofts consists of two adjacent, historic buildings. The Burnap Building, a six-story commercial building designed in the classically ornate Sullivanesque style, stands on the western side; while the Dwight Building on the east, a ten-story commercial property, is considered to be the first steel framed structure in Kansas City. Both properties were built during 1909 and 1902-1903, respectively, with additions constructed during the Roaring ‘20’s. 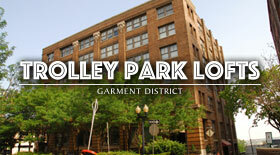 Several neighborhood amenities such as restaurants, bars and coffee shops are mere minutes away via walking while popular destinations such as the Power & Light District and and venues such as the Midland Theater, the Sprint Center and the Municipal Auditorium are located a few blocks south of the Library Lofts. The River Market district, another immensely popular destination to the north, features both locally-grown fruits and vegetables and more exotic fares such as ethiopian, vietnamese and brazilian cuisines. Highway access to other areas of Metropolitan Kansas City is swift using the Broadway Bridge to major thoroughfares such as I-70 and I-35. Additionally, the north and southbound Streetcar stations can be found on Main Street just one block east. The Library Lofts is not just a place to live but a place to celebrate living and enjoying the best of what Downtown Kansas City has to offer. Location, aesthetic and affordability set this comfortable residence apart from the rest. Don’t miss out on exciting urban explorations and the meaningful connectivity that city dwellers dream of. Club Room – Residents can entertain family and friends in a contemporary social lounge, featuring a pool table and indoor putting green. Computer Lounge – Residents have access to high-speed internet. The building is connected to Google Fiber. Storage – Individual storage spaces subject to availability. Parking – Attached garage parking available. Interior Design – High ceilings, hardwood floors, vintage architecture, spacious closets, skylights. Security – Courtesy patrol and secured entrance. 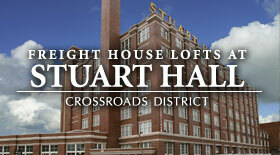 Building Features – Historic charm, three large elevators, central location.